Watch Endro! Online - Endro! Naral Island, a continent with swords and magic in which humans and monsters coexist. The terrible Demon King lives there. In ancient times, the first-generation hero defeated the Demon King. Over the many successive generations since then, the Demon King has been resurrected, and the hero who opposes him has likewise reappeared. Girls attend a school for adventurers in order to defeat the Demon King when he appears again.Though a bit absent-minded, Yusha has the body of a hero. The holy elf Seyla’s trouble never ends because she is too serious. The cheerful warrior Fai loves to eat. Mei is a quiet otaku magician. 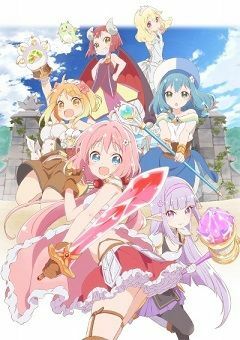 As the four girls aim to be in the hero party, they live relaxed fantasy lives and show no sign of defeating the Demon King no matter how much time passes.